So after all the work and the clouds of dust finally settled over everything we owned. We have a new patio and driveway. They are both lovely and completely level. And better yet they are done in just enough time for the kick off of summer and a huge party. The downside of the project is we had the driveway and patio done, not the landscaping and completion of the yard. So we are now faced with the somewhat uphill battle of the remainder of the back. The Monet lawn we had going, comprised of some grass but a lot of weeds that from far away when mowed looked like a lawn have all but been killed off by the countless wheel barrel trips and heavy machinery. So more to come on that. Here are the before and after pictures. I love how it all turned out. The patio/driveway replacement is in full swing now. I am happy to report it is moving faster than expected, which is so exciting. I have learned a few more things this week. There is a lot of dust generated by this type of work. We have several different type of pipes in our yard: Sprinkler pipes to non-working sprinklers, drip irrigation tubes that went to old fountains, pipes that lead no where and just end, and the best ones are the pipes that just disappear into another part of the yard. A mystery for a later time. I wish I had more pictures of the backyard pipes but demo went fast. Did I mention that everything was covered in dust. I now know how to shut down the water for our house. It takes my father in law 7 minutes to get to my house when I call in a panic, see #4. Expect the unexpected at our house. Although, a lesson I learned when we renovated the house I was gently reminded by that around 2 yesterday afternoon. There is 20 tons of material coming out and going in for the project. Here is the stone we picked, Belgard Positano. I love the colors and texture to them. Can’t wait to share the finished product. So we have had weeks of no activity on the house and then all of a sudden last week we took a huge step forward. I have discovered although my education was amazing what I should have gone into was masonry. Because as someone who has never had to replace a driveway or patio, I found myself saying things like, “How much could this cost?” The answer was not what I had expected to say the least. But as you can see from the pictures the driveway had become a hazard and the backyard is cracking apart, so we need to do something. 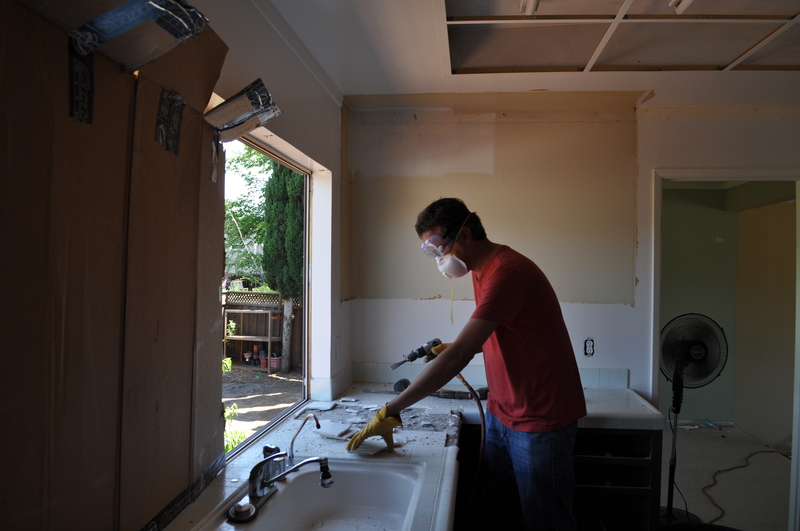 And as I was told by everyone who came to give us a quote, “It really adds value to your home.” So I am repeating that mantra to myself as we start Demo Day. So we spent this weekend ‘cleaning’ up the yard and putting things aside to start demo today. I am both excited at the prospect of a yard and driveway that I can walk on without tripping and scared of what we will find. Since we are only 30 minutes in and have already found a problem I am sure it will be an interesting few weeks. Weeks and weeks ago I planted bulbs in the front. It was going to be a kick off to the new yard. After weeks and weeks, nothing. Not a single one of them sprouted. So I gave up and broke down and went to buy some plants. So I rolled up my sleeves to finally get the front yard going. But of course I found this. And of course not just one but 4 of the 5 bulbs I had planted. So now we have a bit of a mixed bag in the front but hey it is something. Onto the next thing. My husband keeps having to remind me that we are making some progress. For me the emphasis is on the “some”. Apparently, I am not independently wealthy nor is the yard my full time job so I have to take baby steps with this one. One big win was the project that not one wanted to do. It has been on a to do list for let’s see, 2 YEARS! We have a crawl space under the back of our house where I am 100% sure the rats from NIMH are living. 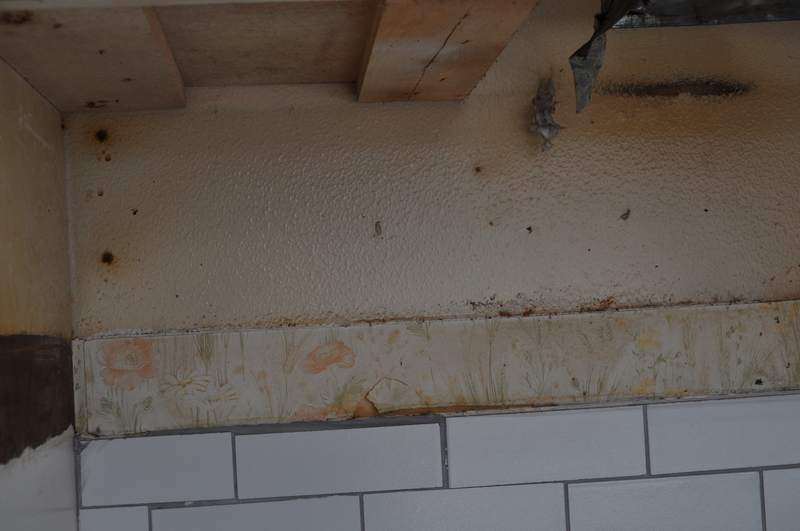 There was a very poorly done cover on it when we bought the house and we should have replaced it then. But, we didn’t have a saw, it was raining, we had a baby, you name it. But this weekend we borrowed a saw and cut a new door. Excuse the paint job as we just wanted to get it sealed before it rained agin which it did that day. I am sure in two more years I will paint it for real. So now NIMH will have to do their experiements under the house. I marked the yard for the raised beds we are going to put in and the shade garden on the side of the house. Ironically, for the pictures the garden is in the shade and the shade garden is in full sun. Might have to rethink the locations. And out of shear frustration I dug one of the bulbs up in the front yard. It has new growth on it so I replanted it. Note to self next time just buy the plants. The back and front yard projects have been put on rain delay. The bulbs that we planted in the front have yet to even sprout. We managed to fill in the holes in the backyard that were created when we removed the deck off the back of the house. My daughter, while my husband filled in the holes, managed to plant giant sunflower seeds in the holes. The sunflowers, of course, are now sprouting and will be 7 feet tall shortly. Hopefully this weekend we can get back out and start some of the projects. The Backyard is overwhelming. I am just going to start there. I had a cold dose of reality this weekend that we are looking at a multi-year project to get where we really want to be. We are very lucky to have an amazing friend who not only makes the most amazing salad and gives the best hugs but also happens to be a master gardener. She came over this weekend to help us build a plan of attack, provide suggestions on everything yard related and provide real encouragement. We now have an amazing starting point. But to know where we are going I thought I would show you where we are starting. The theme of the yard was sheds, fountains, astro turf, trees and stuff. When we bought the house there was a small strip of cheap turf laid over bark which was added as a selling feature. Sheds, sheds and more sheds. Plus, our trees are an amazing fruit called Green Sicilian Nectarines. Minus is that ALL the trees are the same. We had 5 of the same tree in the yard. We have since cleared quite a few things out. Here is where we are starting from. from far away it almost looks like all the random grasses and weeds make a lawn. The thought of all the work that will be going into the front and backyard is overwhelming so I thought it best to start with a small project. A quick win would be just what we needed to spur us onto the larger projects to come. In a discussion with my husband it turns out we both hated the ‘bush plant things’ in the front yard. So why not start there? We started with cutting down the smaller of the plants but were quickly derailed but what can only be described as THE WORLDS BIGGEST SPIDER. My husband thought it best to try and get it off the wall it had clearly claimed as its own so we could continue to work but after the spider reared at us we said fair is fair and moved, temporarily, onto the other side of the bed. The good thing is that most of the plants were mostly dead so they came out easily. The bad thing is that the roots are prolific and put up a fight. Our yard gets a ton of sun so we looked for something that could tolerate full sun. So bulbs are planted but it is yet to be seen if they will “impress family and friends.” One project down. When we bought our house one of the key selling points was the yard. Now I recall as a child pleasant memories of playing in the front yard with the neighbors, helping to water the garden in the back, and the triumphant day when our tether ball was installed. I was clearly not paying attention to the countless hours of upkeep and constant trips to the home improvement store that made this wonderland possible. We have a good yard but it is not in great shape. 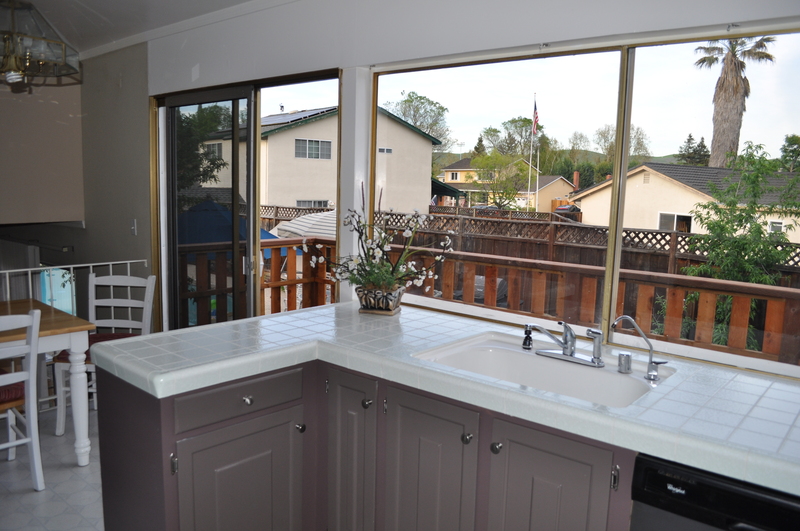 When we bought our house we devoted our efforts to the inside and it’s major renovation. 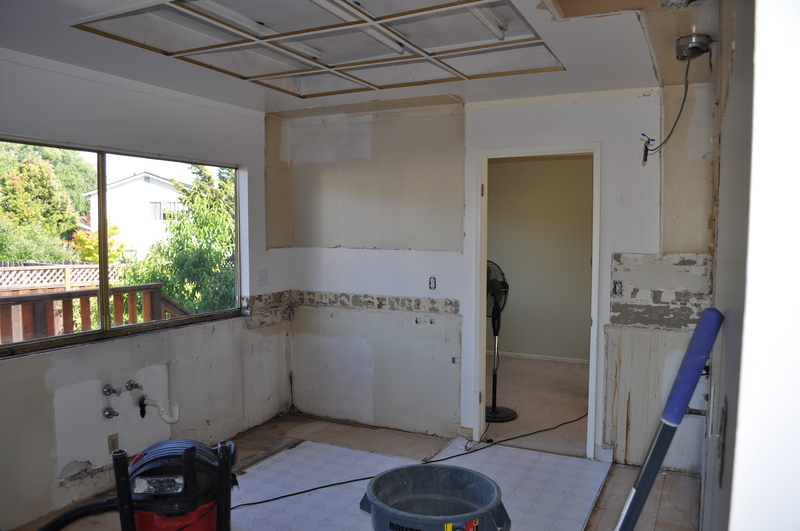 I had intended to blog the entire transformation but honestly I was too tired at the end of the day and mostly forgot to take pictures as I was crying about another issue or cursing the house for being a money pit. So no several years in we are starting to focus on the front and back yard. I am going to attempt to chronicle this, fingers crossed, transformation. 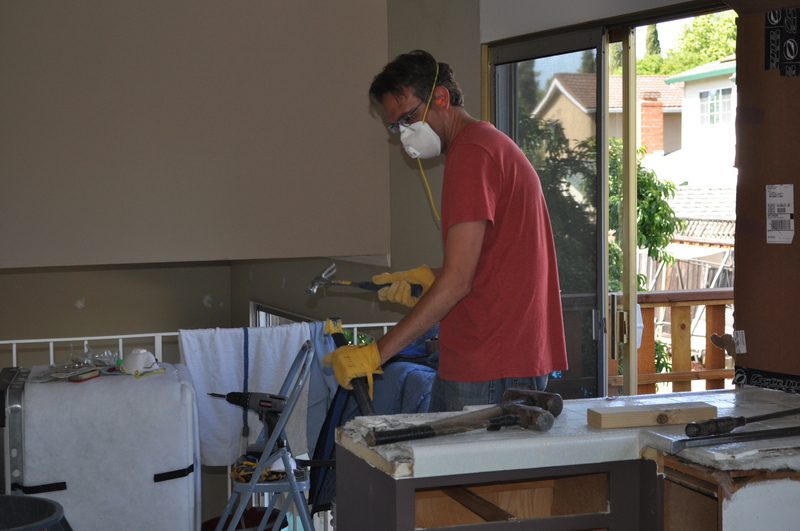 We did demolition on the whole rest of the house a few weekends ago. Thank goodness for the long weekend, as we needed every moment of it. 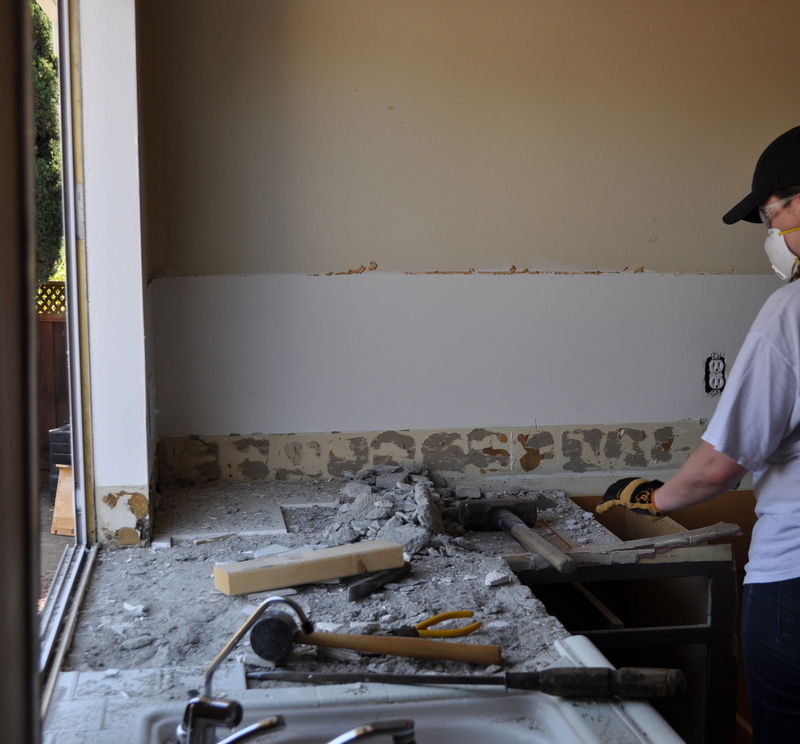 I wanted it to be like HGTV, where you pause and blink on the demo and you are on to picking the backsplash. I was missing the cast of thousands they have working on the demo for that to happen, I had my loving husband and my devoted mother-in-law and I have to say we did an amazing job. 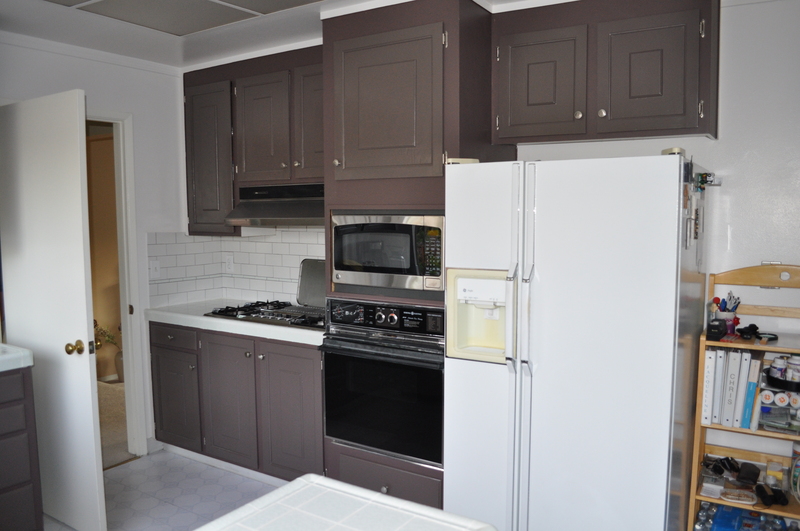 The kitchen we are replacing was original for the 1960’s that was ‘updated’ by the sellers with some eggplant purple rustoleum spray paint and a very uneven backsplash. What we found was priceless. Now I have never the opportunity to remove a kitchen nor do I know anything about what that entails. “How hard can it be to take something out?”, me at 8 AM. 6PM me had a few other choice words. There were gas lines, water to disconnect, nails to step on and a serious amount of concrete and chicken wire to deal with. We started with what seemed like the best idea, remove the doors. The rest of the demo was not as easy as the doors. 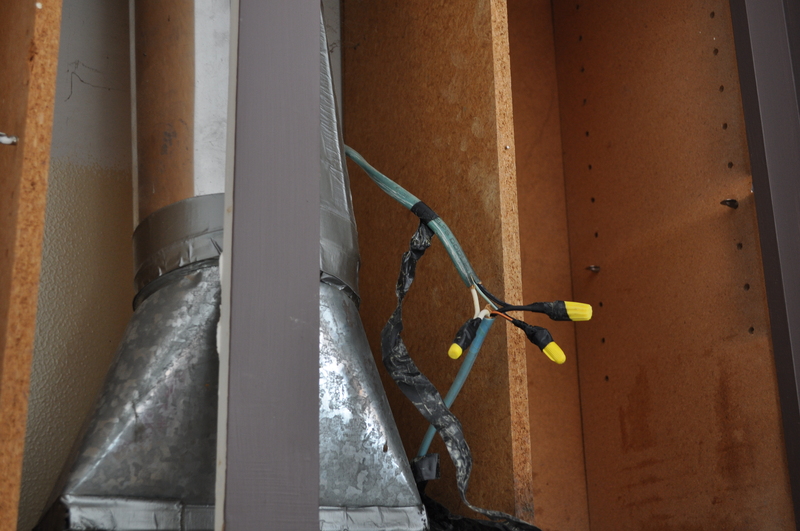 We have been clever enough to hire a professional for such simple tasks as relocating gas lines and properly venting the oven through the roof. Basically, things we know nothing about nor are interested in reading the code about. Now there was no actual plan for how to take this down so here it goes in pictures. Remarked on how lovely the wallpaper from the 1960’s was. Cleaned out the gross stuff the old owners left. This made my husband super happy about our purchase. 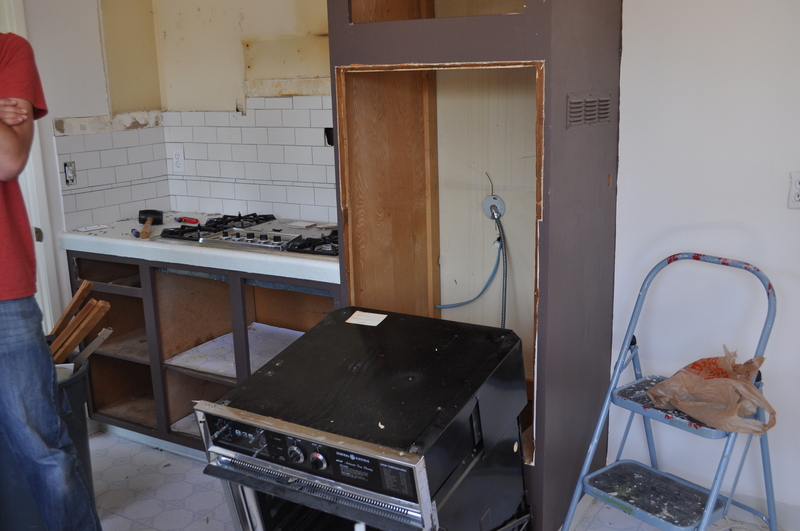 Removed the wall oven. This was a special discovery as it is was just vented through the cabinet to what had been the refrigerator. Luckily, our contractor had stopped by and was able to confirm that was not up to code and help us safely remove the gas line while we all agreed it was luck the house was still standing. 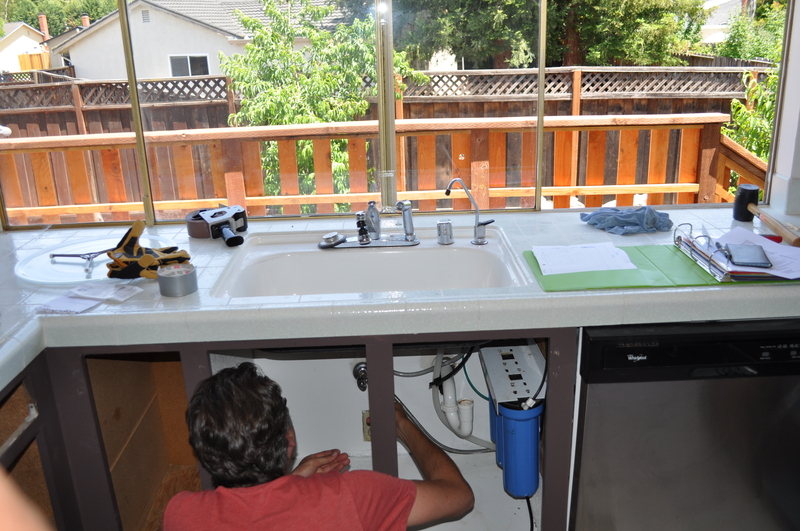 Removed the water filter, which they had running from a line in the garage and just drilled through the floor to get it into the kitchen. Also up to code. 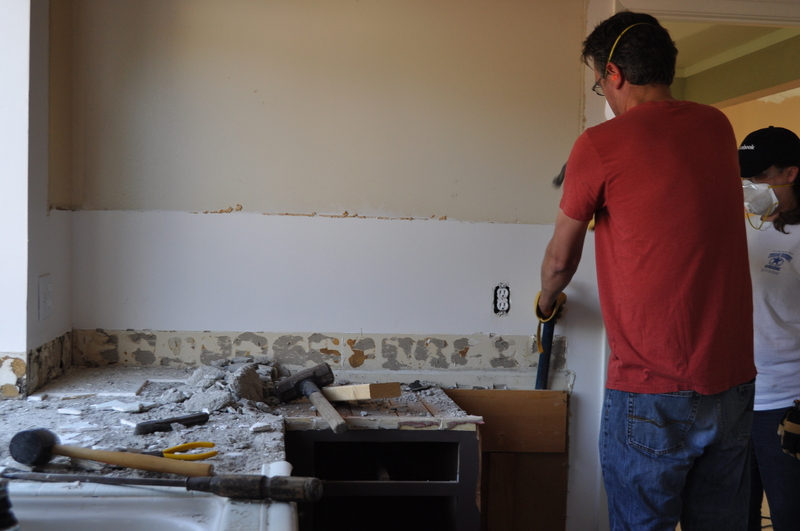 The air chisel made a re-appearance for this project but was not as effective as we wanted so we went to my favorite the sledge-hammer. It was cheaper than therapy and a better workout. After lunch we went after the cabinets, again with no plan. 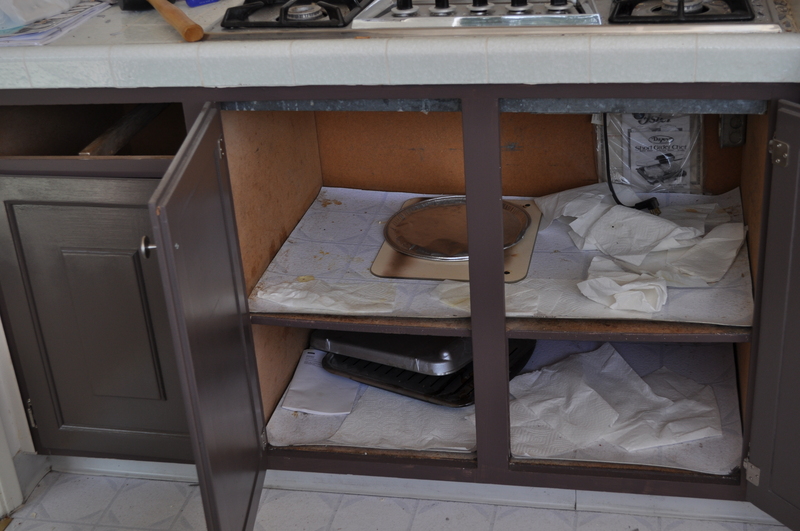 I am sure there are teams of people with crack plans on how to take out kitchen who get it done in like an hour. We were decidedly winging it. The chisel and hammer seemed to work best for us. At this point I was mad. Mad about the kitchen, mad about the process of getting the house and the mess it was. This was supposed to be my dream house. So I did what every self-respecting girl from the mid-west would do. I told my husband to stand back and channeled by angst out on some 1960 tile. It was amazing. 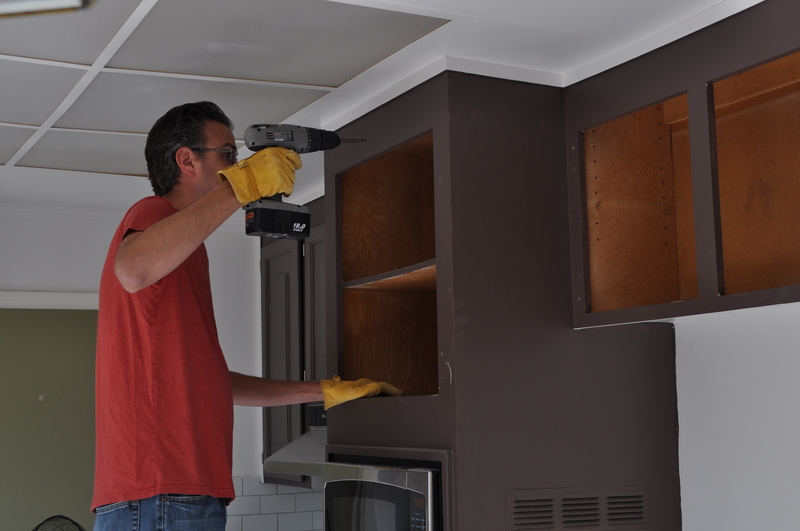 I ended up taking the cabinets out below the counter and brought it down from the top. It felt good. It felt really good. Things I had not thought through. All these items needed to be moved outside the kitchen and would need to be disposed of. My observations, concrete is heavy even in small amounts and chicken wire it very sharp. Will get that corrected the next time I renovate a kitchen. 9 hours later victory and a very empty kitchen was ours. Now onto weeks without a kitchen. Happy PB&J Tuesdays.